Published: Dec. 5, 2014 at 02:50 p.m. The NFL changes in an instant, which is why it's important to stay abreast of how your players are looking prior to Sundays. Below is a look at whose stock is rising and whose is falling, as we approach Week 14 and the fantasy playoffs. Keep an eye on these players heading into Sunday to help make the right choices for your fantasy lineup, as their stock could be on the move again before kickoff. I was high on Hopkins this offseason, so it was great to see him explode last week for 238 receiving yards and two touchdowns. 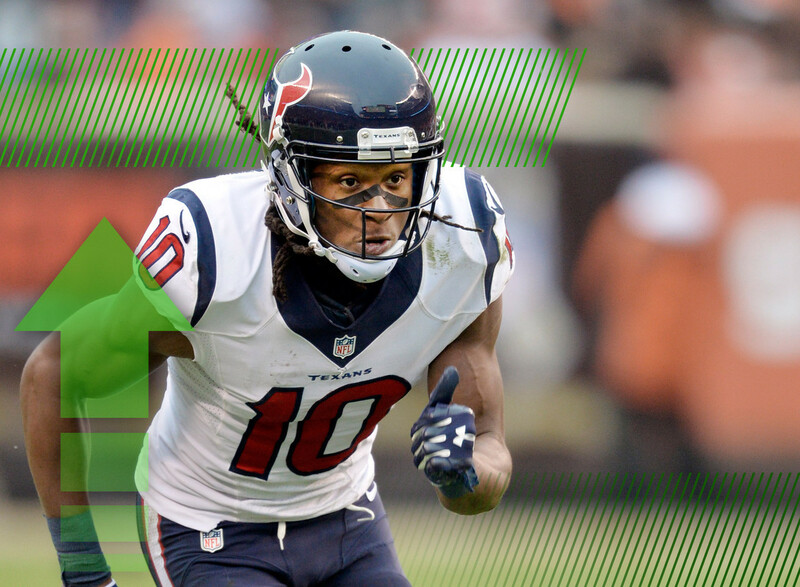 Hopkins has let the world know that he's the best receiver on the Texans roster right now (which is no disrespect to Andre Johnson). Hopkins has another nice matchup against the Jaguars in Week 14, though it'll be hard for him to replicate his Week 13 performance. Hunter was also a trendy offseason sleeper, but sadly his second NFL season has come to an end. Hunter took a massive hit from the Texans' Daniel Manning, and the result was a lacerated spleen for Hunter and a trip to the season-ending IR. If he can correct his drops, he'll be back on the sleeper radar in 2015. This isn't an endorsement to go out and put your fantasy playoff hopes on the shoulders of Fitzpatrick, but he deserves mentioning after his career game last week. I want to see if this offense can do it again before getting more on board, but for now Fitzpatrick's stock is on the rise as well. The list of quarterbacks who have outscored Kaepernick over the last four weeks is frightening. It includes Zach Mettenberger, Josh McCown, Alex Smith, Kyle Orton and Andy Dalton, to name a few. As Chris Wesseling detailed in his excellent breakdown of the demise of running quarterbacks, Kap has displayed accuracy and touch issues in addition to taking sacks at an alarming rate. Even against the Raiders, I'd be worried about starting Kaepernick. The Daily Show has looked like the best running back on the Panthers for weeks, and he will get his chance to prove it in a featured role with DeAngelo Williams sidelined with a hand injury. Stewart is a great flex play going up against the Saints this week, and an awesome option if you play daily fantasy football as his price is cheap in most leagues. Fleener has performed well with Dwayne Allen out with an injury, but his stock takes a hit this week as Allen returns to the lineup. Both Fleener and Allen have a nice matchup against the Browns this week, but neither can be trusted as more than a low-end TE1 as they figure to eat into each other's targets. Well, it's official. Cordarrelle Patterson has been benched for Johnson. We knew this was coming, and it's really kind of surprising it took the Vikings this long to put their struggling wideout on the bench. Johnson has some nice upside this weekend as he should be able to get open often against the Jets secondary. He's a frisky flex or WR3 play if you're looking for help heading into the fantasy playoffs. Over the last four weeks, Watkins hasn't had more than four catches or 35 receiving yards and has failed to score a touchdown. It's not like he hasn't seen his looks either, as he's had 31 targets over that span which is tied with Robert Woods for the most on the team. Whether he's hitting a rookie wall or being schemed against more by opposing defenses, Watkins' stock is on the decline. I've been talking up Stills for weeks in my Deep Dive column, so it was great to see him deliver a monster game. With Brandin Cooks on IR and Marques Colston slowing down a tad, Stills is turning into the No. 1 wideout for the Saints. He'll have a chance to further earn that title if he can deliver in a great matchup against the porous Panthers secondary. Jackson has had a solid season for Washington despite the near constant turmoil at the quarterback position. However, he suffered a leg injury last week and hasn't practiced all week as a result. He's officially listed as questionable, but he seems like a severe long shot to play on Sunday. Look elsewhere for wide receiver help if you were hoping to start Jackson this week. Bailey has quietly turned into the type of wide receiver the Rams drafted Tavon Austin to be last year. Bailey has turned his 15 targets over the last two weeks into 12 catches for 189 yards and a touchdown. He'll have a chance for a third straight productive week against a Washington secondary that reached new levels of atrociousness last week when they gave up four passing touchdowns over 30 yards in length. Bailey has great value in daily leagues and as a flex or WR3 for Week 14. With Brian Hoyer being announced as the starter for Week 14, Manziel's stock takes a hit, but it hasn't bottomed out. There's still a chance that Hoyer could lose his hold on the starting gig again, and if he does Manziel will have some sleeper value as a low-end QB1 or QB2 down the stretch. Hang onto him for at least another week if you scooped him up off waivers. Landry has become one of Tannehill's favorite targets of late. He's seen 37 targets over the last four games, and 10 or more targets in three of his last four games. Right now, Landry's best value comes in PPR formats, as the Dolphins still struggle to push the ball down field. Regardless, Landry's stock is on the rise as the Dolphins will continue to look his way as they battle for a spot in the playoffs. I'm still baffled by the fact that Graham was held without a single target last week. That means Drew Brees didn't throw the ball his way even ONCE! While Graham's stock is down a bit, it makes this the perfect time to get back on the bandwagon. An overcorrection is coming, and with a plus matchup against the Panthers on Sunday, Graham could rebound in a big way. His price is way down in daily fantasy leagues, too, so don't be afraid to roll him out there as well. Murray has been cleared from the concussion that took him out of his breakout game in Week 12, which is great. It took Murray all of four carries to prove that he's the most explosive playmaker on the Raiders. While his stock is on the rise, owners need to temper their expectations for his production this weekend, as the team doesn't want to make him the workhorse yet. And this is why the Raiders can't have nice things. After missing practice on Wednesday and Thursday with knee soreness, Forsett returned to action on Friday. Thank goodness, too, as he'll have a nice matchup against the Dolphins, who have been shredded by the run in recent weeks. LaFell, initially perceived as a reclamation project for the Patriots, has turned into a relevant fantasy commodity. With Aaron Dobson landing on IR, LaFell has even less competition for targets in the Patriots offense. He'll be a solid WR3 for the rest of the season. Ellington has been dealing with a hip pointer injury, and is now officially out for Sunday's game after missing all of the team's practices this week. This means Marion Grice and Stepfan Taylor will likely split the carries in an ugly committee situation. If you must roll the dice with one of these guys, I'd go with Grice. No running back has scored more fantasy points over the last month than Anderson, who leads the NFL in yards from scrimmage over that span as well. He suffered a minor ankle injury, but has practiced in full all week and will be good to go for Week 14. He's still an RB1, even against the tough Bills run defense. Forgive me if I'm not buying into the "Trent Richardson revenge game" as he returns to Cleveland. I could shower you in a litany of statistics to backup this point, but I'll just say this instead: DON'T START TRENT RICHARDSON. There. Enjoy your weekend and good luck to those of you in the fantasy playoffs!